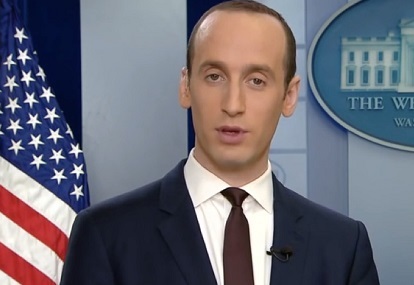 Stephen Miller, the wizard behind the curtain, the power behind the throne is the architect of most of the immigration policy put forth by Donald Trump. Stephen Miller was born in Santa Monica, California, on August 23, 1985, to a Jewish family whose ancestors fled persecution in what is now Belarus. His uncle has called him out for being a hypocrite on immigration, considering his family background. He was instrumental in the policy of separating children from their parents at the southern border. That being said, I am confident he supports the chorus of "build the wall,” "stop illegal immigration,” "limit legal immigration especially those from sh*t hole countries,” and “reduce issuance of H-1B visas to Indian technical workers." It is music to the ears of hardline Trump supporters - a classic example of being whipped into a frenzy over a topic that is driven by ignorance or prejudice. They believe or have been convinced that crime would decrease, welfare rolls would be reduced and employment will soar as we only allow in a limited number of highly skilled immigrants from select countries. The idea sounds so plausible, logical and workable. However, for every action there is an equal and opposite reaction, and the solution to one problem creates another. So, whoa, let us slow down, take a deep breath and think this thing through. There are employment vacancies all over, many of which I notice on my drive to the drug rehab center in Bartow where I minister to addicts, the majority of which are able-bodied young men in the prime of life who should be out working and filling those said vacancies. There is a shortage of over the road truck drivers who transport more than 70 percent of the nation's goods. It is estimated by 2030 there will be 330,000 unfilled truck driving jobs. The avocado farmers in California are experiencing a lack of available American workers to harvest their crop. They must look for migrant workers from Mexico. A construction company in Ohio has had to decline bidding for certain contracts, is unable to expand, because he does not have sufficient help, hampered by the scourge of the opioid epidemic. He moans, "can you imagine putting somebody on a roof who is high on drugs? I can double my business if I can find people who are able to pass a drug test." In Iowa, a state whose economy is based on animal husbandry and agriculture, 68 percent of the jobs are filled with Mexican workers. Even after the murder of Mollie Tibbets by a supposed illegal alien, the cry of “deport them all” is muted, carefully measured at best, and completely silent at worst. These are hard, nasty jobs that no citizen is rushing to fill. African Americans are not willing to work in these types of occupations because they are too reminiscent of slavery times. Caucasian Americans consider these jobs to be beneath them. I remember the oncology nurse from California whose deportation sorely impacted her community and fellow workers, as well as the wife of the Iraqi war veteran who uttered a particular, poignant salient statement on her departure from the U. S. "I fail to see how my removal helps anybody." It sounds so good, logical and reasonable to some people--"deport them all you say." "Hire American workers," you so breezily proclaim, blissfully unaware of the consequences of such a decision. You see, everything works on paper in Washington D. C., but, alas, not so smoothly in the hinterlands. You need look no further than the impact of the tariff wars on soybean farmers. Here is the hard, inescapable, unavoidable truth--no present enterprise can survive without capable, sober human workers, and we have not yet developed an army of cost effective mechanical workers to replace them. So, in the meanwhile you still need people to perform these menial, undesirable tasks. I have yet to hear any comment from Hormel foods or Armour meat packing company. You can almost hear the echo from Ohio, Iowa, Nebraska, North and South Dakota. Fine, how do I go about it? Tell me how? Show me where? With their crops rotting in the fields, unfulfilled orders piling up, their livelihood disappearing over the border on the back of the last foreign worker as he is evicted, the beleaguered farmer is left to wonder why. All of this mess to fulfill a misguided, shortsighted campaign promise. Is this any way to run a business or a country?